Thanks to my new September 2014 Hip Kit & Add-On Kits from Hip Kit Club, I can now say that I have entered the world of Gelatos! Yes, I'm a little late to the game, but wet mediums still slightly freak me out, because of crumpled, wrinkled paper. But I loved the colors of the Faber Castell Gelatos, Kimberly included as the Color Add On Kit this month and I just couldn't resist trying them out for myself! Since I am a beginner with Gelators, I went with a fairly easy technique, and drew several circles on my background paper using the Coral colored Gelato. Then I spritzed over my paper with water and used my finger to blend the color. I added the Teal Gelato to the center of the circle and repeated the same process. After my page was dry, I used a fine point Black pen to draw some messy circles around the Gelato color. I really had fun using the color in my background and I'm looking forward to using the Gelatos on more projects! I still ran into problems with getting my page to flatten out for the photo. I just can't figure out how these Mixed Media gurus get their pages to lay flat, after adding wet mediums!! :) Maybe one day I will master the trick! 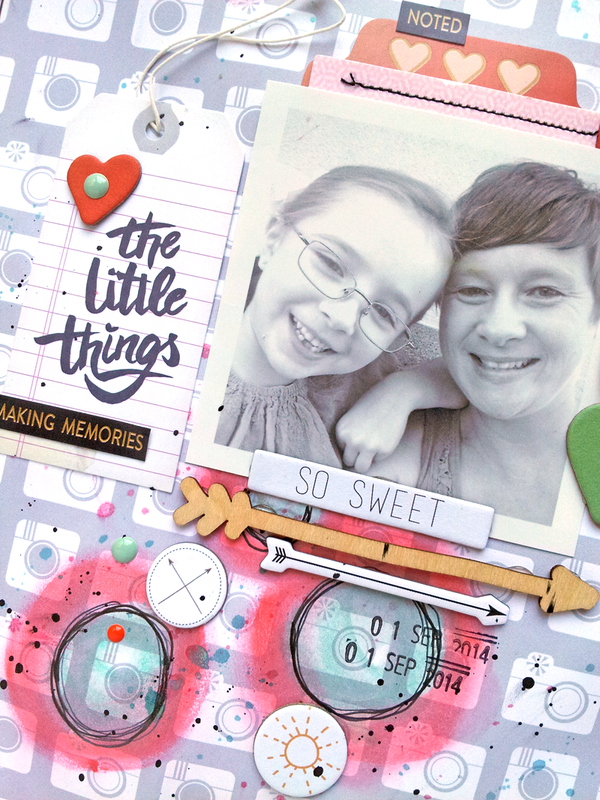 I created this quick card, using only 5 products included in the September 2014 Hip Kit & Add-On Kits. 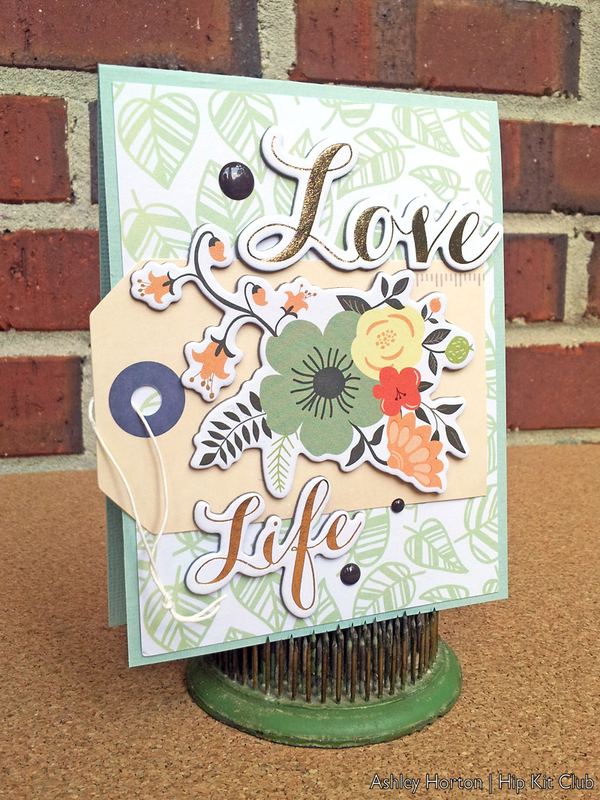 I love the Chipboard pieces from Teresa Collins, and I knew I wanted to use one of the large flowers, along with the sentiment, Love Life. My base is from the light Aqua cardstock included in the Cardstock add-on. I wanted to continue the floral theme, so I layered a piece of the Nine & Co. patterned paper from Teresa Collins over my card base. And my final two products were one of the tags from the Crate Paper Notes & Things tag pack and Enamel Dots from the My Mind's Eye Market Street collection. If you want to get your hands on the September Kits, make sure you visit the Shop ASAP, because they are going fast! You'll definitely want to get in on these, before they sell out! !